Making art work for your business! More than ever a professional designer needs vision. "What am I trying to create?" "What's the function of this particular piece of my clients' marketing?" "What are the possibilities?" It's not what is available on computer that gives rise to the finished items but the vision inside the creatives' head that drives the finished marketing ideas to match that specific client perfectly. Artwork should be unique, artwork should be original, artwork should be carefully designed to fulfill the requirements of the brief - written or not. Manipulating the image can replace costly replicas and originals and they can produce a better end product. The vision of an experienced designer will ensure your requirements are made for you to market your business professionally. Avoid free artwork the chances are it has been sold to someone else as well as you! Front cover below left and inside the open leaflet. Site being updated, please bear with us! The A5 right and business card below were produced by clever Photoshop image manipulation and clean typography skills. 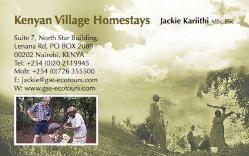 Posters are now on display in Kenya too with a new version of the brochure and business cards aimed specifically at the market in Kenya.